Located in a building that doesn't look as large as it really is, but once you begin touring the museum, you suddenly surprised at how many displays and exhibits fit into the small building. The architecture of the museum has a colonial when viewed from the street, but the rear main entrance is almost art deco and not in keeping with the rest of the building, or the fabulous artifacts on display. Inside, there are 2 levels and one area set aside for children. The rest of the space is devoted to exhibits and a large meeting room that gets regular used for town meetings and discussions. Each area on exhibit floors are arranged by category such as 19th Century life, transportation, fire fighting, minerals, agriculture, military, Native American and a variety of other categories. Transportation covers the gamut from a Conestoga wagon to a 1925 Model T Roadster. Also on display is a collection of vintage bicycles that were the rage just before the turn of the 20th Century and the invention of the automobile. There's also horse drawn hearse with elaborately carved details and lanterns on display. One of the largest funeral coach manufacturers was located in Allen County: the Superior Coach Company, which also made school buses. The first thing you notice when entering the lower level is the iron lung. Having grown up in the 50s before polio vaccines had eradicated this disease, I was very aware of these machines, but had never seen one in person. 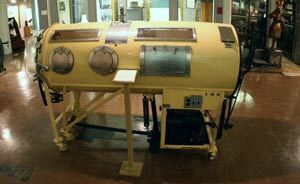 The iron lung was used to treat victims of respiratory paralysis, often caused by polio. The patient’s entire body, excluding the head, was placed in the tank. A rubber collar was fitted tightly around the neck to avoid pressure on the windpipe and voice box and to prevent air leakage. As pressure in the tank was increased the patient’s chest increased, moving air into the lungs. When tank pressure returned to normal, the lungs released air. This process was repeated about 15 times per minute over prolonged periods. One of the more recent displays is the recreation of 47 year old Sheriff Jess Sarber's office and holding cell. In 1933, after robbing a bank in nearby Bluffton, John Dillinger was captured and awaiting trial in the Allen County Jail. Sheriff Jess Sarber was on duty when 3 of John Dillinger's friends broke into the jail and freed Dillinger. In the process, Sheriff Sarber was gunned down. The tabloid depicts the room exactly as it was just minutes before the jail break. After the jail break, Dillinger rose to the top of the FBIs 10 most wanted fugitives. He and the gang were captured less than 3 months later. However, Dillinger again escaped custody and was later gunned down by FBI agents in Chicago in July 1934. The 3 gang members (Makley, Clark, and Pierpont) were tried and 2 received death sentences and Clark got life in prison. While awaiting their execution in the state penitentiary in Columbus, Pierpont and Makley attempted another escape. Makley was shot and killed and Pierpont was wounded. Pierpont was later executed in 1934. Clark was released from prison in 1968 on the same day as the Bluffton bank robbery 35 years before. He died of cancer later that same year. Another oddity to this crime was that Sheriff Sarber and John Dillinger were both born on the same day, June 28. The Elizabeth M. MacDonell Memorial Library in the Allen County Museum is a wealth of information for researchers and genealogists. The library contains books, maps, microfilm, vertical files, photographs and periodicals which provide information about collections, geographical, historical and biographical information about Allen County and its residents as well as surrounding counties, Ohio and neighboring states, including those areas from which Allen County pioneers originated. The entire collection of the library is non-circulating. If you're in Lima, a trip to the Allen County Museum is definitely time well spent. The information and exhibits are well presented and organized. Expect to spend about 2 hours. Admission is free.